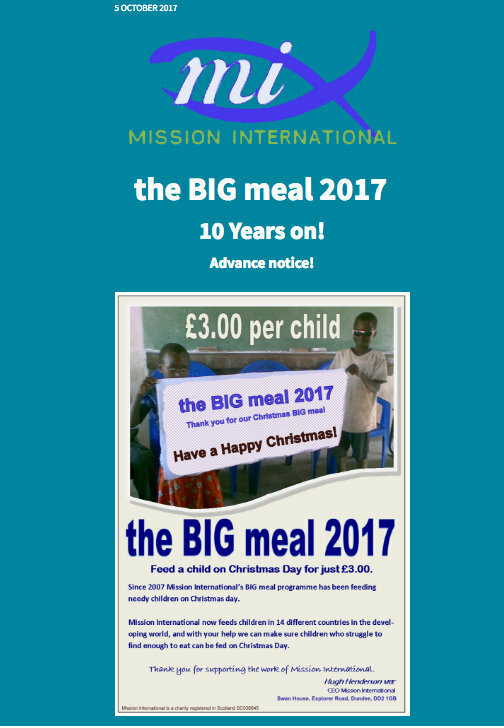 The BIG meal is designed to provide a special Christmas Day meal for needy children in the developing world. Mission International partners around the world identify needy children in their communities and serve them with the help of local church members and parents. The children enjoy a programme of stories, dramas, singing and of course their BIG meal. Mission International supporters and donors provide the funds in all sorts of ways. Some give personally, others fund-raise in their locality, providing the necessary funds to provide a lovely meal on Christmas Day. Mission International also raises funds for our Mighty Meals programme which feeds needy children every day that they attend school.